On Saturday night, April 14, the great CNN’s Wolf Blitzer interviewed one of his panelists about James Comey’s justification for violating over a half-century of Justice Department policies in Republican and Democratic administrations when he sent his October 28, 2016 letter to Congress that cost Hillary Clinton the presidency. Comey has repeatedly claimed that he was “obligated” to write his speculative fact-free letter because of a promise he had made to Congress to do so if “anything new” came up after his July 5, 2016 press conference announcing no prosecutable case could be brought against Hillary Clinton. However, I established beyond any doubt in my book published in February 2018 — “The Unmaking of the Presidency 2016—How James Comey Cost Hillary Clinton the Presidency” (Scribner) — that Comey’s claim was and remains false. In fact, Comey ONLY promised Congress in September 2016 that if anything new came up on the emails issue that might cause the FBI to reconsider its non-prosecution decision, then he would only “take a look” — NOT make a public disclosure to Congress before doing so. When I wrote my book, I avoided using the word “lie” about Comey falsely using the word “obligation” to Congress — given my extreme reluctance to ever use the “lie” word unless I am certain there is a knowing, willful, intentional misstatement of the truth. Well, James Comey has had plenty of time to go back to check his testimony before Congress to see what he actually told them as he begins his book tour and, among other things, tries to justify his writing his October 28 letter that violated 50+ years of DOJ policy. Yet, in the already-released excerpts of the TV interview with George Stephanopoulos televised on Sunday night and presumably others, Comey intends to repeat the same knowing falsehood that he was “obligated” to send his letter to Congress because he promised to do so. Also, another form of a lie is by omission. 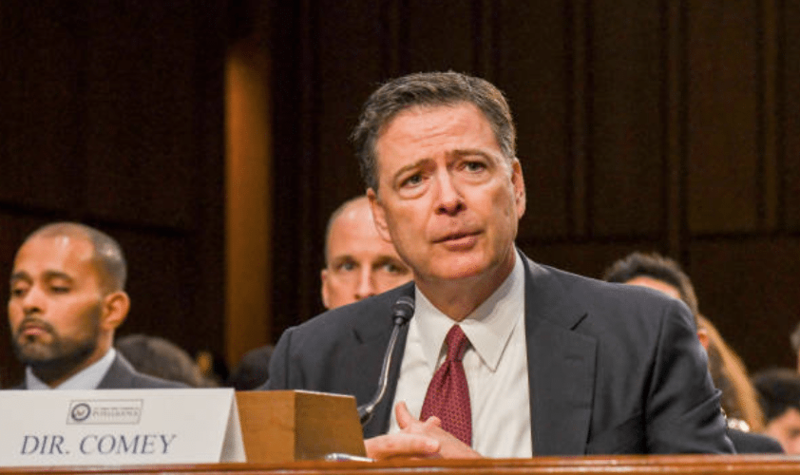 Comey knows — and knows that we all now know — that if he had done what in fact he had told Congress he would do, i.e., looked first before writing his letter, he and the FBI would have completed their review within 6 days, as we know happened between Oct 30, 2016, when they first began to look at Clinton emails on Anthony Wiener’s laptop, and November 5, when they completed their review. And we know that they would have determined — as they announced on November 6, two days before the election — that there was no there there in the Clinton emails, i.e., nothing new to change their July 5 non-prosecution decision. Thus, there would have been no need for Comey to write the history-changing October 28 letter. And hence, Hillary Clinton, as all the data proves over the last 11 days in the crucial battleground states, would be president today. So admit the truth, Mr. Comey - and stop lying. You wrote the letter not because you had to in order to fulfill a promise to Congress, as you write in your book and have told interviewers, but because you wanted to protect your politic rear end from anti-Clinton Congressional Republican partisans. Period. And to CNN and other mainstream media that I greatly respect - please do your factual homework as you do your interviews and commentaries on Comey’s book. And call him out on his lies - documented not only in my book but also in other publicly available records. Mr. Davis served as Special Counsel to President Clinton and is a columnist for The Hill Newspaper. He is the author of “The Unmaking of the President 2016: How FBI Director James Comey Cost Hillary Clinton the Presidency” (Scribner).